Welcome to this week's guest, Pat Bubash, a fellow St. Louis Writers Guild member! Her professional career was in education for more than thirty years, mostly as a school counselor, family advocate, and adult education instructor. Her M.Ed. is from the University of Missouri, St. Louis, with 30 hours in post-graduate work in testing and assessment. She is a Licensed Professional Counselor and a Stephens Minister. As a counselor, she has served on various boards: Kids in the Middle (children of divorce), The Olive Branch (homeless pregnant teens), president of St. Louis Association for Counseling and Development. She authored a book, Successful Second Marriages, and submits articles to a variety of online sites. When and why did you begin writing? Writing is something I have always enjoyed. Unlike my fellow classmates of (many) years ago, when the teacher assigned a writing assignment, I did not groan, but happily began writing. I remember with such delight my fourth-grade teacher telling me I had the "10" dollar word when I asked her how to spell "convince." I think the assignment was on Christopher Columbus. When my turn came as a teacher, I created assignments with the intent of encouraging even the "non" writers to unearth their creative juices by utilizing art, sports, even cartoons to inspire the reluctant writer. Letter writing was another form of creative writing for me. As a child and an adult, I often lived far away from our relatives. There was no email nor Skype available at that time. I wrote long, informative letters describing my environment, school, and new friends. I continue to send notes, letters (a little less lengthy!) via snail mail. I find my thoughts flow as my pen hits paper. Funny, but I have never been keen on keeping a journal, but love writing letters. How much time do you spend on research? What type of research do you do? I encourage writers to belong to an organization that promotes writers, provides resources, encouragement, support- what we need to foster our continued writing. I was not so fortunate to be aware of St. Louis Writers Guild or St. Louis Publishers Association until "after the fact" - my book was completed when I discovered what a wealth of information had been available. Another "late to me" is the importance of building your platform before you even publish your book. Do this via blogs, social media, organizational involvement-develop a following of readers who will be looking forward to the book that you will be providing for them. I am still looking for a critique group that works for me- relationships is a different style than the writing of the novelist, but I do know belonging to a critique group is beneficial in developing good writing. A new area of platform-building for me has been BlogTalkRadio. In the past months, I have had several interviews on a variety of shows -- a new experience for me, which I am finding very enjoyable. Is there anything you find particularly challenging to write? I love listening to people's stories, and, then writing about them. Of special interest to me are the personal accounts of accomplishment, survival, and achievement. Interviewing is exhilarating for me. I find myself lost in the words of the speaker anxious to put their words into a story. This excitement does not carry over to writing poetry or fiction. I was sorely disappointed to discover I really did not "understand" nor could I get the style to be a contributor to the Chicken Soup books. These three areas are not only challenging for me, but seem to allude me. My niche is developed as a result of my counselor role. I have an understanding for people's life experiences, an empathy, personal connection making the writing flow easily. I have one challenge that I am determined to overcome: I want to write my parents' life story. I have starts everywhere, but no chapter yet! What inspired your latest book? My book was inspired by the parents, students, even grandparents who shared the emotional difficulty of divorce. As a school counselor, my office was a safe place to shed tears, unburden, and speak honestly about anguish, hurt, disappointment, even anger. Whatever I was told, I could have responded with, "I know how you feel." I knew because I had experienced the same life-changing situations. So, not only did I want to provide a book of inspiring, encouraging, and hopeful stories, but I found the process of interviewing and listening therapeutic for me. This goes back to the previous comments: I love hearing people's stories, and I want to share them in a positive, helpful way for others. Note from Pat: "When Bill McClellan readily and graciously gave me a review [on the back cover], I was thrilled. I admire, enjoy, aspire to his style of writing. The other compliment for me was the number of readers who stated, "I felt that I was sitting in the room with you as you talked with the couples you interviewed." That was the goal, a style that was easy to read, personally relevant, meeting the tag line: inspiring, encouraging and hopeful." SUCCESSFUL SECOND MARRIAGES: Patricia Bubash, M.Ed. 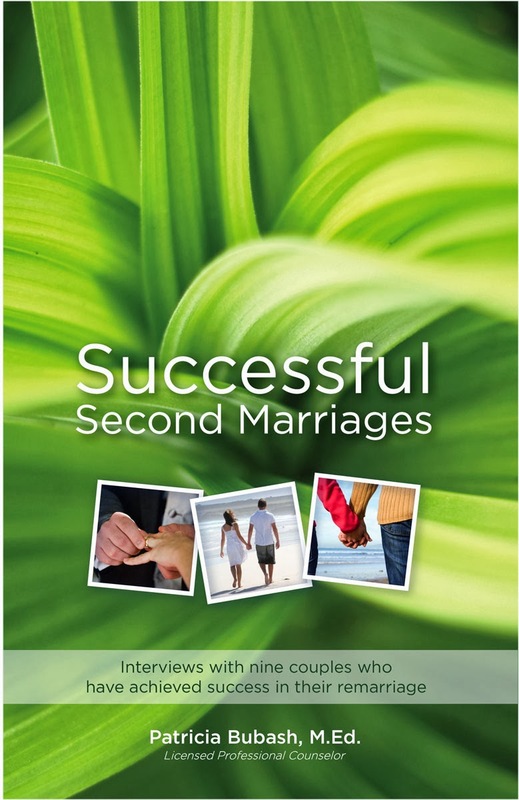 Licensed Professional Counselor, interviews nine married couples who have achieved success in their second marriages in her new book, Successful Second Marriages. Patricia was inspired to find the formula for a successful second marriage as a result of the failure of her own own marriage, motivated to look for the secrets to what it takes to make it work and share her findings with the world, using her own pain to help others. Her discoveries are written from an open-hearted, transparent point of view that is accessible to readers and gives them the sense of reading something far more personal than your traditional “self-help” book.